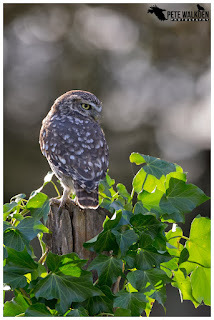 My adventures with the little owls started a bit later this year than before, as I had wrongly assumed that the introduction of a pig-pen into the area right beneath the entrance to the owls' nesting area and favourite tree, had spooked them into leaving. I had visited several times since the porkers arrived, but failed to see any of the owls. 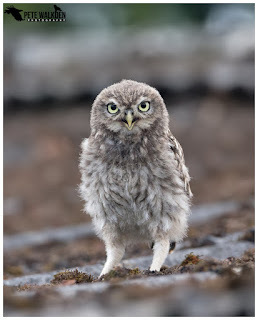 Whilst cleaning away the mud, cow and sheep poop collected on my car from the Mull Photo Tours one Saturday in July, one of the lads from the farm parked up at the end of my driveway, and informed me he'd seen the owls recently. The cleaning was rapidly finished off, and I trundled over to the farm with some intrepidation to see what was going on. Were they really back? What had I missed? Had the pair bred again? Within seconds of me parking up beside the barn, one of the adult little owls swooped down from the oak tree, scuttled along the roof and then stared at me, as if to say "Where the hell have you been?" I had to laugh - I know they're wild but I'm pretty sure they recognise me from the other people around the farm. The pigs had been and gone; replaced by some of the growing flock of sheep at the farm. I was unable to park as closely to the barn as before, but as normal, the farmer was quick to say if I wanted to move or rearrange things, I could. 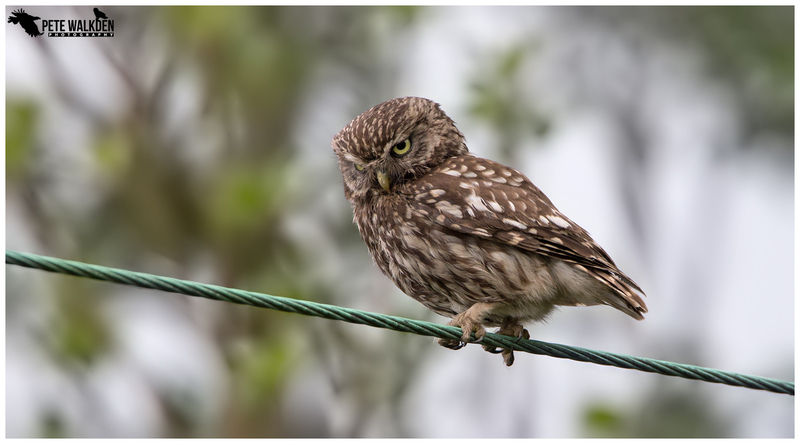 And as I moved the car around the fencing, so I could see more of the end of the barn where the owls normally look out from, I spotted it... a small grey ball of fluff, perched on the felt roof of the pig-pen, and it was staring at me. 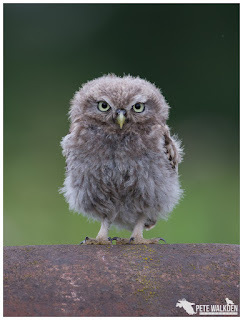 An owlet! My excitement levels were going into hyperspace mode - I love these birds, and to realise they'd raised another young owl was wonderful news to me. 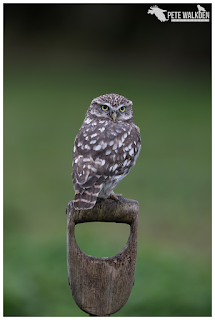 As I'd not been there, and hence not been supplementing their need for food with what I put out, the adults were in full flow with hunting, and it was eye-opening to see how quickly they caught food, especially small rodents. 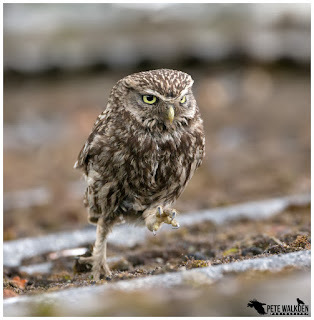 As well as perching high on roof-tops, the owls would use the powerlines to watch from, and swoop down on to voles and mice as they strayed out into the open, such as crossing the track across the farm. After a quick run to the local exotic pet shop, I returned with some food for the owls, and in that short time away, one owlet had become two! 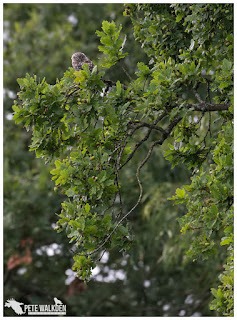 They were perched in the oak tree, hissing away, demanding to be fed by the adults. 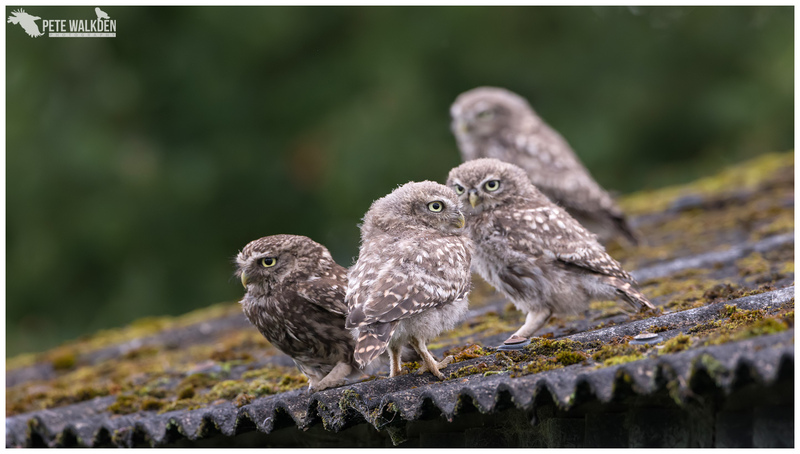 Not only had I missed them branching from the nest area, I'd also missed them mastering flight, which was shown when one of the youngsters swooped down to the roof where an adult was, to collect a meal directly. And after being fed, it remained on the roof, scuttling round in search of food for itself. Not short on confidence or mobility already. Of course this all meant I could re-open the Little Owl Workshop for the season, and it was a race to get the site presentable for visitors, some of whom had been patiently waiting for news on the owls since the winter months. By the end of that first frantic week, not only had I reconfigured the site for visitors, let all the punters know it was open for business again, but also realised that the owls had managed to raise three owlets this time, and all had successfully reached the safety of the tree. Unlike last year, where there was only one owlet to feed, it was interesting to watch the adults provide food, and distribute it fairly between the three hungry fluffballs. Two of which were obviously older than the fluffiest one; perhaps the runt of the nest. But it had made it out, and was as demanding as the others. However, it tended to remain alone, whilst the other older chicks often sat beside one another. I didn't think the adults could work harder after last year, but with three beaks to feed, as well as their own, they seemed to be all over the place, bringing in food from all corners of the farm. This also allowed me to test out some ideas for getting images of them, introducing props and perches, gaining both running and more flight shots. The latter are never easy, as the owls don't fly in a flat line, more of an undulating path, which is a nightmare to track in the camera. 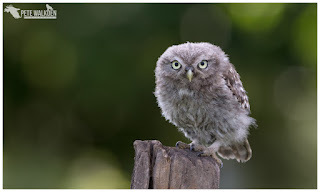 With more than one owlet, I was able to observe interraction between the youngsters, as well as with the adult owls. 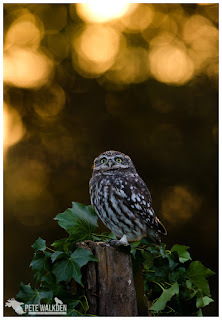 On quieter days, I picked up different calls from the owls, between the almost constant hissing for food of course. And the alarm calls, surprisingly, came from all of the owls at times, highlighting their ability to make adult calls from early on in their lives. 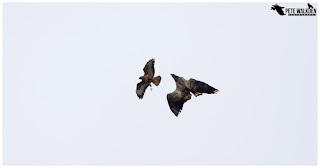 Admittedly though, they weren't able to determine what a real threat was most of the time, and they scuttled and flew to the safety of the barn at the first sight of wood pigeons, jackdaws and gulls. Thankfully they also recognised the local buzzards as a threat and vanished whenever they flew by. 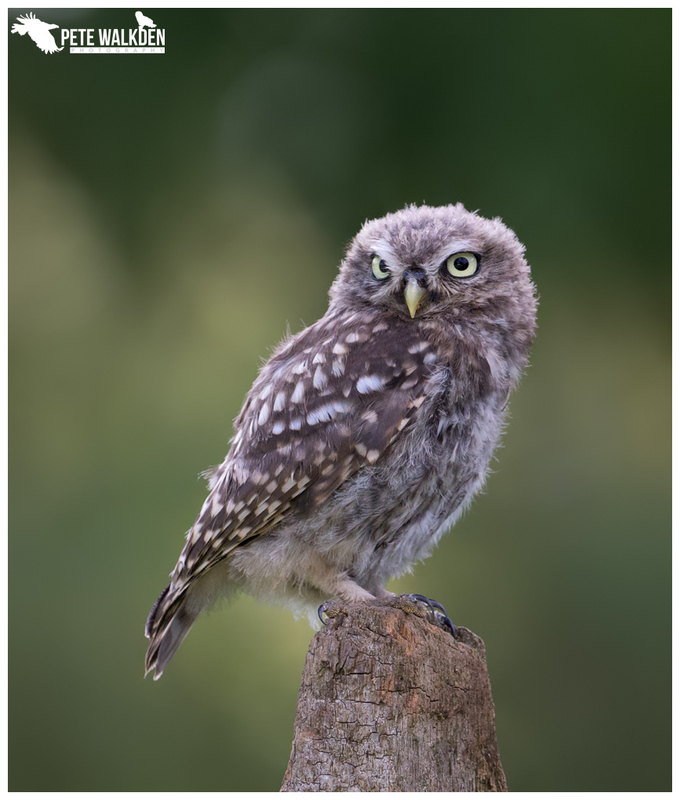 Into August, and all of the owlets were confident enough to start visiting some of the perches I had put out for the adults to collect food from. Also by now, the two adults had become one, and just the male was left. This happened last year, when the female (I assume, as the male tends to hold on to breeding sites from what I have read) left just after the young branched, leaving the male to do the remaining work. Perhaps the effort of creating and laying the eggs, followed by intensive brooding in the nest, and then the frantic, relentless gathering of food takes its toll on the female, and she leaves to allow herself time to recover. It must be an incredible effort for her each year, and by the time she departed last year, she looked like she needed a break. 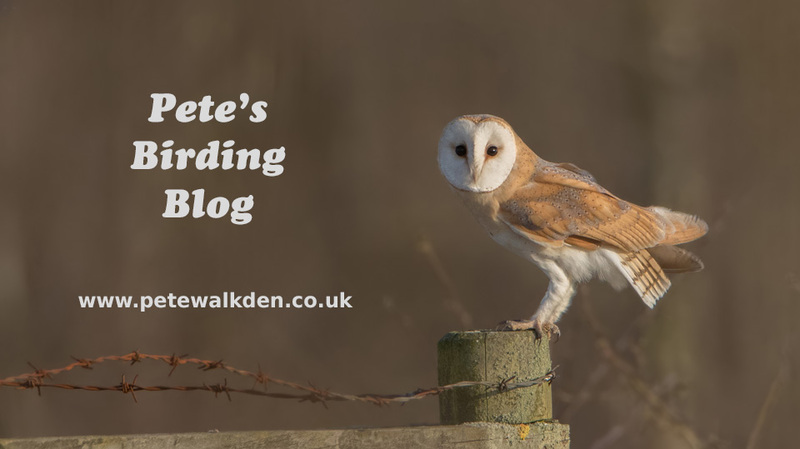 Over the next few weeks, I was joined by some clients who enjoyed fantastic views of the owls, taking thousands of images of them and their antics. 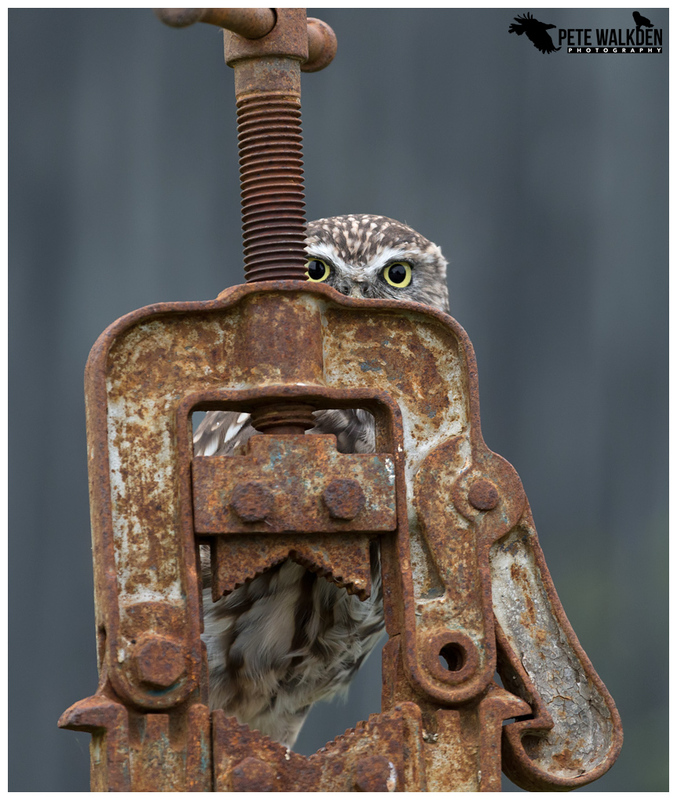 During the workshops, I don't tend to take any images myself, but still enjoy the days, as I simply observe the owls, making mental notes of anything they might do that strikes me as unusual. 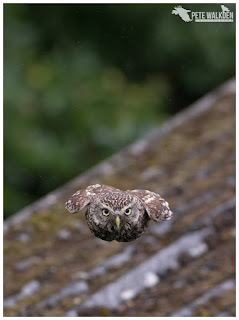 While the owlets were confident in landing on perches, and running around the roof or along branches, they struggled on some perches, often having to fly off again after failing to balance properly, though one incident showed how much grip and strength they have in their feet and talons. 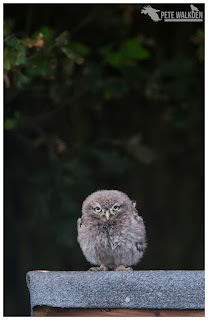 Also interesting to me was how wary the owlets were of me. Last year, the sole owlet of the brood was very tolerant of me, and would perch only a few feet away, when I was walking around the patch of land by the perches. It even landed on the windscreen wipers of the car once, to peer in at me through the glass, though I suspect it was more interested in the wriggling mealworms on the seat beside me. 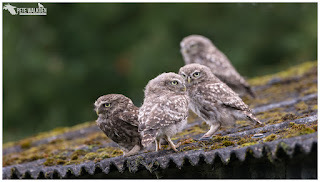 This year, perhaps because I hadn't been there as much, or maybe because the owlets had each other to grow up with, they behaved more like the adults, and were quick to move away should I push my luck at all. 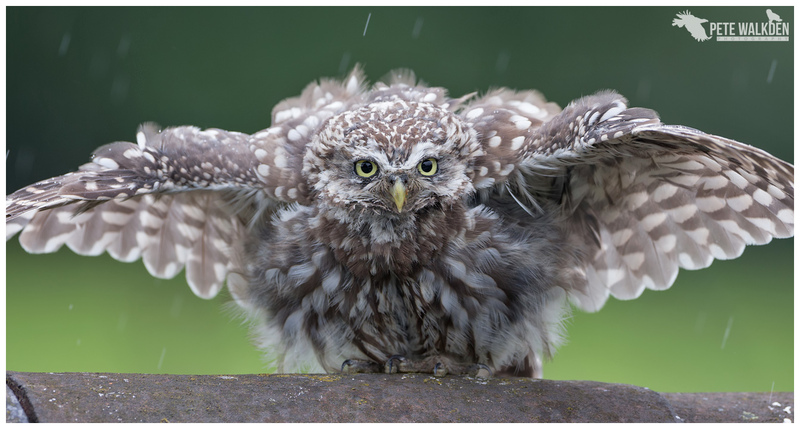 As the owls grew up, so did their levels of confidence, and it was intriguing to see how they behaved when other birds approached. Frequently corvids such as jackdaws or carrion crows would land on the barn roof, to investigate the food on offer. 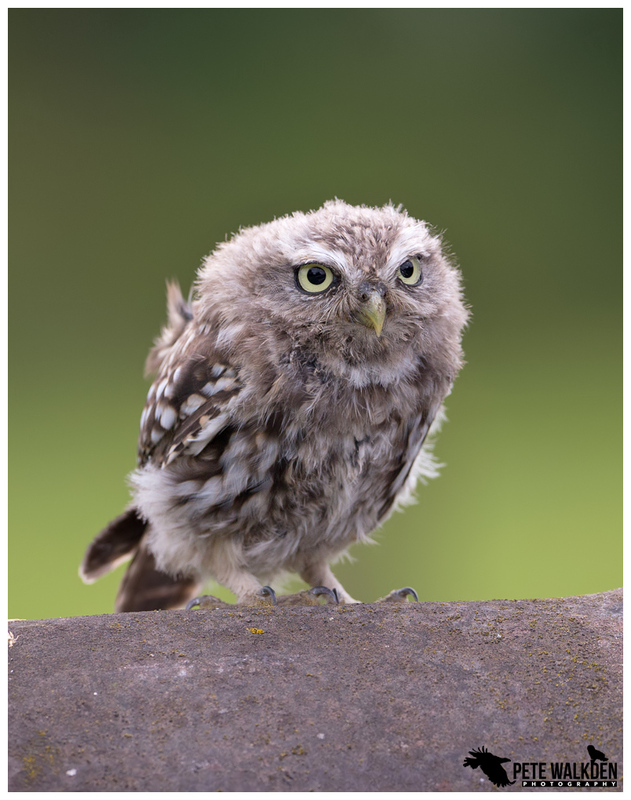 Initially the young owls would flee, but within just a week or so, they had learned that these birds weren't a threat, and would just keep a watchful eye on them. The local robins would live up to their name, frequently "robin" the food put out. 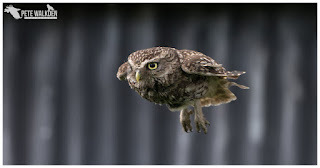 Sometimes the owls would just watch them, but other times, they chased them away. And appeared angrier than usual, if such a look is possible. 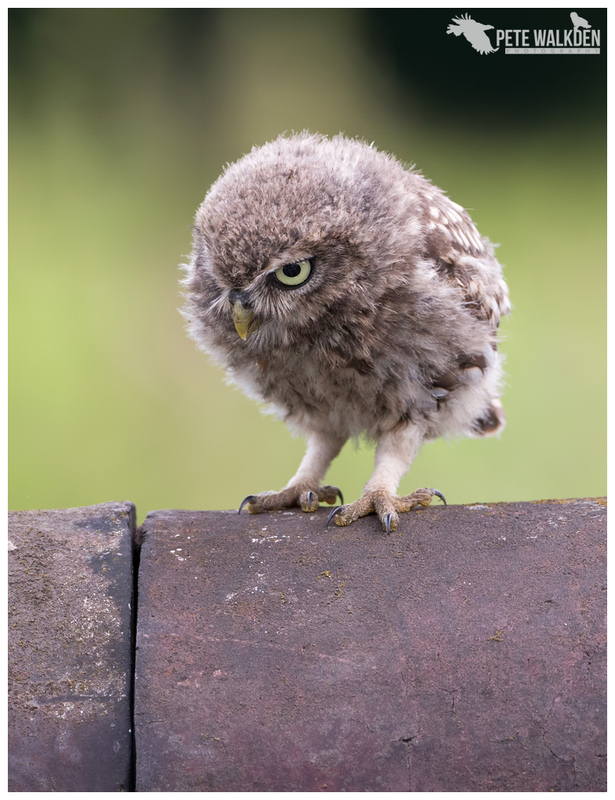 Birds such as wood pigeons, pied wagtails and blackbirds were all largely ignored, but magpies had to be watched closely, as they often harrassed the young owls, even pursuing them to the entrance of the nesting area, if they fled. It was clear to see the difference between the adult and the young here, as the older, wiser owl would stand its ground and if pushed, actually chase the magpie away. 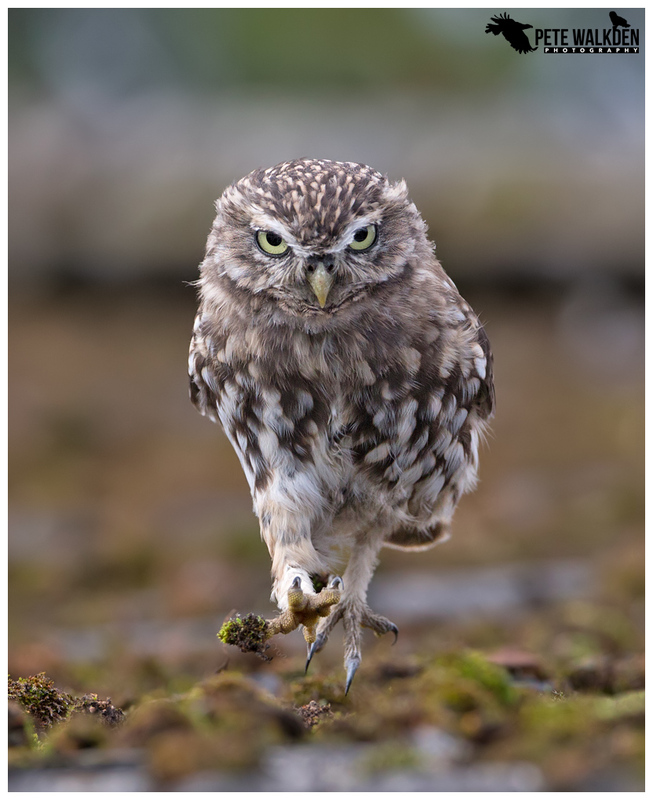 By the middle of August, my thoughts turned to Mull again (holiday this time), so I would be leaving the owls to their own devices for just over a fortnight. This wasn't a problem for the owls, as I ensure that my additional feeding isn't something they rely on, and without it, they would simply target other hunting areas, and prey, more often. The older owlets were already showing signs of adult plumage, but the runt, was still very fluffy indeed, even if it had already mastered the angry glare of the adults. 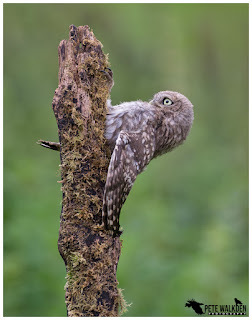 While I was gutted to leave Mull in early September, I was keen to catch up on the little owl family on my return. One observation I had made during the workshops before going to Mull was that one of the owlets, perhaps the oldest one, was following the adult across the farm to where he was hunting from time to time, and I wondered if perhaps the others might be doing the same on my return. The owls were dotted about the yard when I first parked up, with one overlooking the orchard area, and another further along the line of oak trees, watching for movement in the grasses of the meadow below. After reintroducing some food to the area I watch, they slowly came back over a period of several hours. Perhaps after seeing the adult drop down for some of it first. 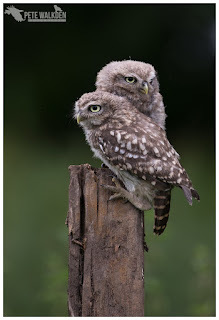 But I could only count two owlets. Initially I hoped that I was simply just seeing two of the three each time, and that I'd eventually see all three together, but the longer I watched, the clearer the picture became. 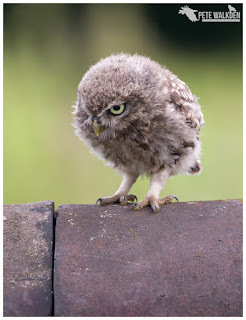 One owlet had gone. I wanted to believe that it had already fledged, become confident enough to leave the nest area, but in my heart I knew it hadn't, and that like one of the previous year's brood, it had met an untimely demise. The farm is of course inhabited by a number of predators of these small owls. As well as the buzzards, there are tawny owls and perhaps even the barn owls from down the hill may have strayed up to the area where the little owls hunted at night. Add to that the possibility of cats, stoats, foxes and maybe even badgers when the owls are on the ground feeding on worms and grubs. Or maybe it was hit by a vehicle on or near the farm. I will never know, as I didn't find any sign of feathers or a body, just a gap on the branch where there were once six taloned feet perched. I know these owls are wild, but it's hard, when spending so long with them, not to become attached to them emotionally. They're not pets, and the young will disperse at the end of the breeding season, but it is upsetting at times when Mother Nature shows her harsher side. The remaining owlets were quite different in their appearance. One remained fairly fluffy, with signs of the large defined "eyebrows" forming, as well as some adult feathers coming through on its breast area. 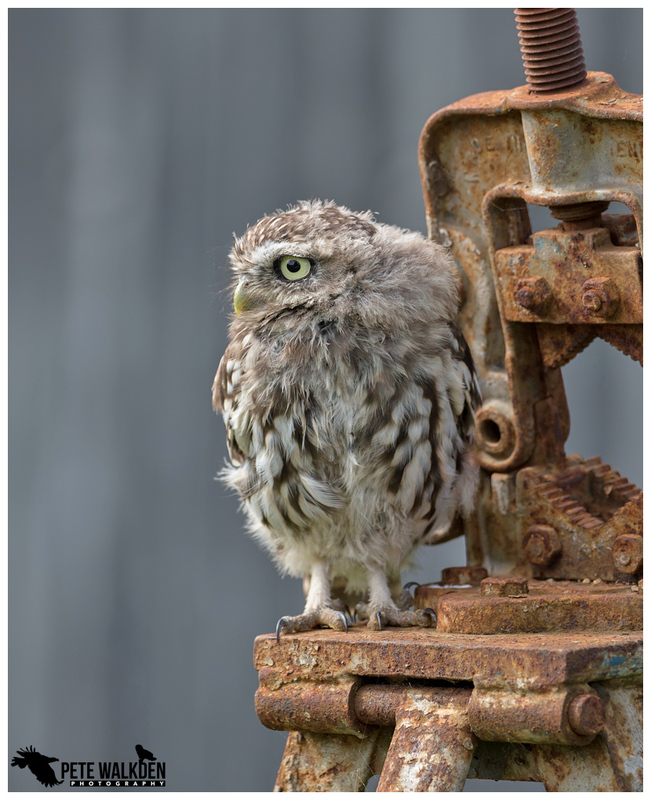 The other owlet was well on the way to looking like an adult, with the flecked feathers covering its head, the pale down all but gone. The adult was starting to look rather dishevelled, mainly from the moult kicking in, and feathers were missing or hanging loose from all over him. Not that it affected his ability to bring back food for the youngsters, though they were more than capable of collecting their own, and often beat the adult to any put out. 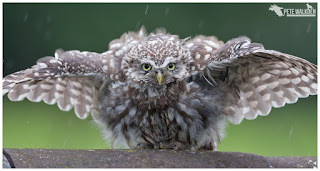 Amusingly, with history somewhat repeating itself, during a heavy rain shower, two of the owls chose to wash their feathers, and I was on hand to record the moment via my DSLR. Last year, a clip of the owlet doing this went so mad on Social Media, I had to turn off my phone to stop it alerting me to activity, and ended up being watched over 250,000 times online. This time it was the adult that stole the limelight, and as I type, I'm still getting "hits" on that clip. 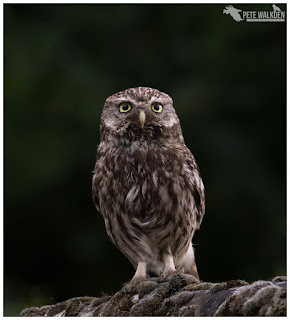 Aside from danger alerts, when each of the owls would call out to alert the others, there was a noticeable change in the behaviour between the adult and the youngsters. 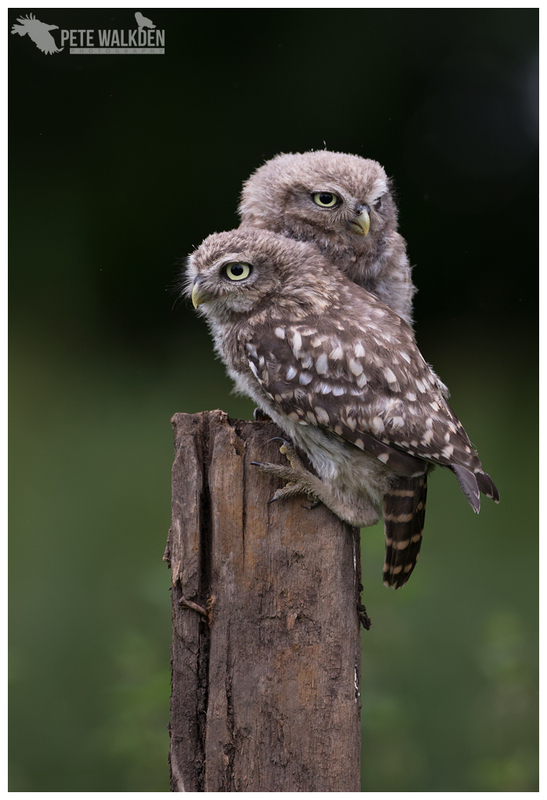 Initially it was just between the older of the owlets and the adult, and they'd not be happy being close to one another at all, but within just a few days, the same traits were apparent with the youngest owlet too. Perhaps the first indication from the adult that he wanted them to think about leaving, to set up their own territories? 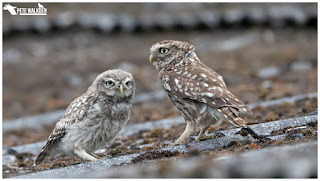 By mid-September, the older of the two owlets was hard to distinguish from the adult; the paler yellow iris being the most obvious difference. The youngest owlet still had some downy feathers around the back of its head, giving it the impression of perhaps wearing a Parka jacket! But that had all but gone too, by the end of the month, and the adult's tolerance for it was being stretched. 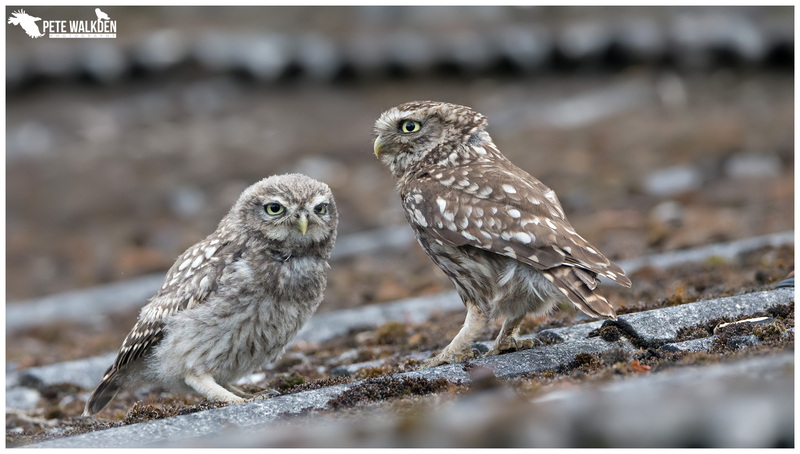 When perched close to one another on the roof, one would make quieter chirruping sounds, but as sweet as they sounded to my ears, they weren't friendly, and the adult would chase the youngster away. 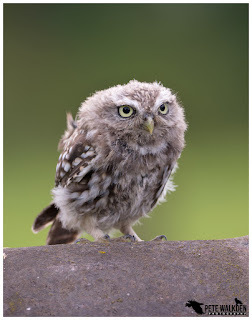 As with last year, the start of October saw the departure of the owlets. 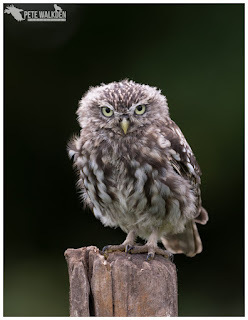 From what I have read, this is fairly typical for them, and I was pleased that this season, my grumpy-looking feathery friend had managed to increase the local little owl population by two. His hard work done for the summer, now he can relax and concentrate on surviving the colder months, before rekindling his relationship with the female, for next years' brood. I have visited the site several times since the young departed, and have seen both adults present, which is promising for next season. When the snow arrived for the first time in years, I made my way to the site in the hope of some views of the owls perched in it. 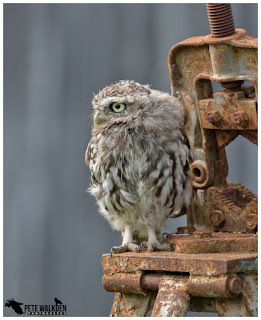 But owls are said to be wise, and they wisely stayed out of the biting wind, and in the relative shelter and warmth of the barn, refusing to venture out for me to photograph. All I saw during three visits to the farm was one feathery head peek out of the barn for a brief moment, glare at me, and then vanish once more! I honestly don't blame them - it was perishingly cold. 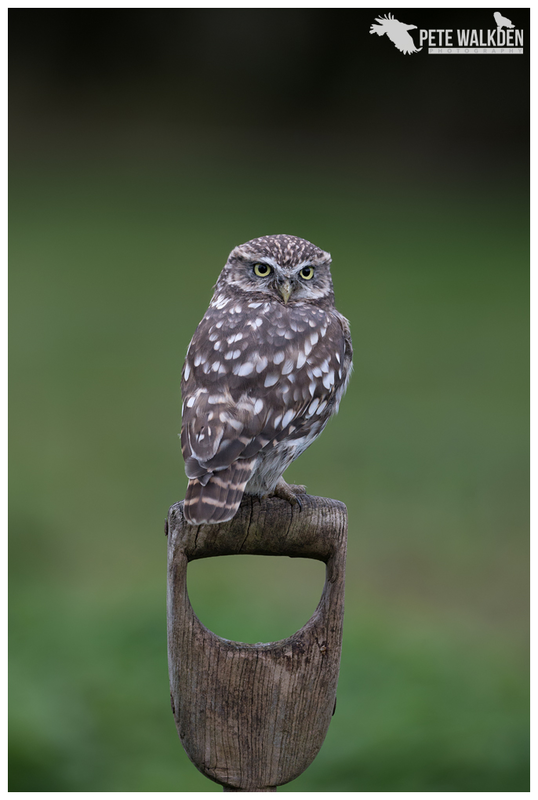 If you're a fan of little owls, and would like to join me for a workshop of little owl photography, please drop me an email (info@petewalkden.co.uk). I will be adding new images over the winter from any visits I make, and sharing any news from the site, via Social Media. Images from the year (and last year too) are available to purchase on a wide variety of media via my website and also my Facebook page, from the Online Shop. This is the last one for this year, I promise. No more Mull-based posts, after this, well until 2018 anyway. But it'd be wrong not to blog about a fortnight spent on the island in November, even if it was primarily about photographing otters. I'd not visited Mull in November before, so I was interested to see what was about at that time of year, and after staying over in Oban on the way up, I chose to take a tour around the lochs on arrival. But not before I'd had a bit of fun with the webcam at Craignure... My brother visited Mull back in April, and was somewhat envious that I was there again, so asked if I could park in front of the webcam near the ferry terminal so he could "see" me there. Simple, you might think, until I worked out that images are taken only every 30 seconds, and when I arrived, I also realised the area in front of the camera was a bit too small to park in. Plus the postal vehicles from the same ferry as I'd been on, were waiting behind me. I had to move on. So it was a real surprise to receive a text from my brother saying he'd seen me! Daft, I know. Plenty of wildfowl on the water - teal, wigeon, mallard and good numbers of divers too, with all three main species in attendance. Herons everywhere, of course, along with the ever-present buzzards perched on posts or dead trees, and mobs of hoodies lurking, turning stones on the shore or flying up to drop shellfish on to the ground to break into the fleshy insides. I needed to see an eagle though, so drove towards an area I have enjoyed success at before, and sure enough, within half an hour, a large shape appeared on the horizon. 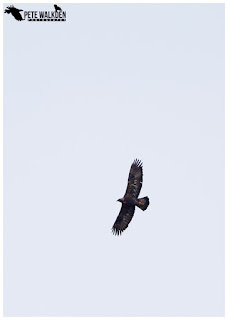 A golden eagle, and it was flapping to gain height, before swooping down like a missile, massive wings opening, and soaring skywards once more. Displaying, in November! Must be keen! 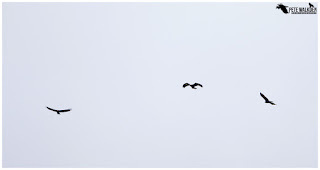 As I watched in awe, I spotted a second eagle approaching, and then remarkably, a third! One was clearly younger than the others, with the white markings on the wings and tail. Maybe a family group? They went their separate ways, but I chose to hang around for more. The gulls, geese and waders on the shore nearby suddenly took flight, and I immediately scanned the skies again for eagles. Sure enough, there was one, only this time it was a white-tailed eagle, a sub-adult perhaps, and it was being mobbed by one of the local buzzards. Surely a risky move, when the eagle is so much larger than the buzzard. But the plucky buzzard got away with it, and the eagle briefly perched on the nearby hillside, until one of the local golden eagles returned, as saw it off again. Not a bad start to the trip. The downside to visits this late in the year is that the days are so brief, and by 3pm with the overcast conditions, it was all but dark! I headed over to the farmhouse to let myself in, and began to get things ready for the two photography tours, co-run with Andy Howard. Andy and Lyndsey arrived shortly afterwards, along with the first of the clients, who quickly settled in. Lyndsey had kindly visited for a night, to pre-cook the meals for the two tours - what a star she is. 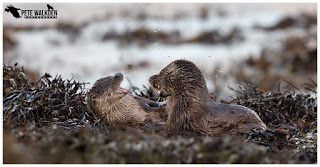 Each tour lasts five days, and the aim for Andy and me, as guides, is to get them close enough to wild otters to leave with some great images, and also memories of the encounters. With just four clients, split into two pairs, we would take them out on alternate days, so each pair enjoyed time with each guide, and perhaps learned different things about the otters, and other wildlife on the isle. Otter photography is as much about luck as it is skill. And my good luck during the first few days seemed to be in short supply. I would spot an otter, or family group, get the clients into a spot for getting images, and then something would go awry. 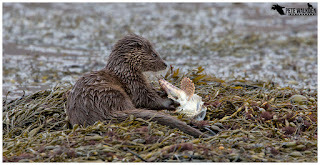 I had a white-tailed eagle chase one otter away (admittedly in horrid weather), then another dominant otter chased off the otter we'd approached, later that day. 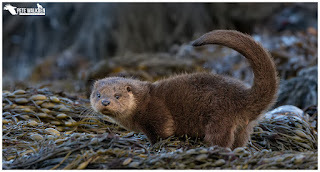 Just as I thought my luck had changed, when we encountered two pairs of otters one morning, I heard the sound of an engine approaching, and a fishing boat managed to spook all four otters away. Patiently waiting to see if the otters would return, I breathed a sigh of relief when one pair swam back out to fish. Clients back into positions... only for the boat to return again, and spook the remaining pair away for a second time. I could have screamed! 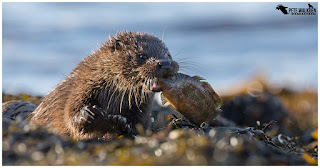 And then late one afternoon, I watched an otter splashing around with what I assumed to be another otter, only to see it drag an enormous lumpsucker fish on to the rocks. Brilliant, it'll be there for ages eating that, I thought. Except as we crouched watching, the wind changed direction, and went from being side on, to blowing a gale from behind us. Bye-bye otter. 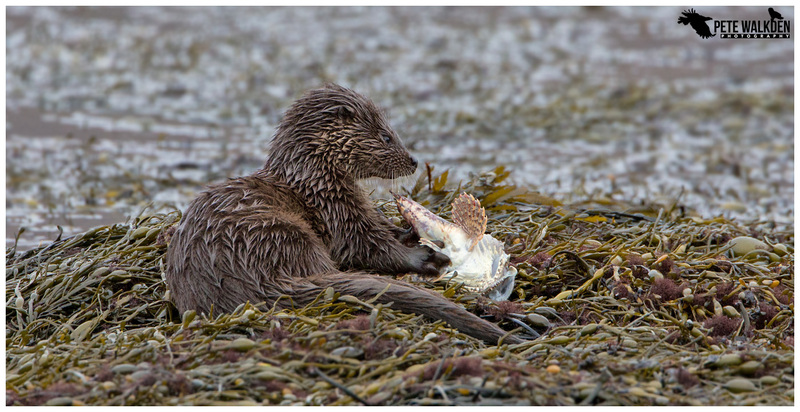 I was as much upset for the otter abandoning the fish as I was for my clients that day, missing out on such a sight. My clients were getting images of otters, but not enjoying the same success as Andy seemed to be getting on his days out. I knew my luck would change, but I had to be patient. And sure enough, it did. 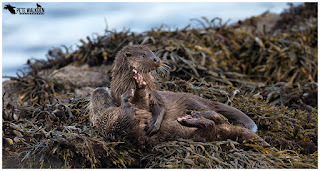 After a very quiet day where birds were the subject for my clients, I spotted a pair of otters coming ashore, and successfully tracked them along the rocks to somewhere we could hide effectively. There were actually three otters, and when one returned to the water to continue fishing, the remaining pair were totally absorbed with playing, so much so, we were able to get pretty close to enjoy the performance. It was the encounter I'd hoped for, and one the pair of clients I had for the day, thoroughly enjoyed. I have to admit, I was mightily relieved too. The first tour had been a success, and the clients left with many images of otters, other wildlife from around Mull, and also with the knowledge of how and when to approach and photograph these creatures. You'd think that after a week of intensive otter tracking, Andy and I would fancy a change of scene, but on our day off between tours, we found ourselves beside a loch, Andy on a bed of seaweed, and me slightly higher up, slumped on some rocks, waiting patiently for a mother and cub to stir from their slumber. We had watched the pair bring food ashore earlier, and then curl up amongst the rocks, to snooze for a while. We hoped for views when they woke up, and our patience was rewarded when mum crept towards us to spraint, and the cub followed. I know as a wildlife photographer I'm not supposed to express many emotions when capturing such images, but we both admitted afterwards that the cub was seriously cute! After leaving their mark on the rocks, both went back into the loch, and we had to follow them along the shore, to where they brought out their catches. Mum seemed to be doing all the legwork, and simply passed the catch to the cub when she'd climbed ashore. With smaller teeth, the cub took a lot longer to make a meal of the fish than the adult otter. It was wonderful to watch though, at such close quarters, and it was hard to drag ourselves away from the action, when the pair moved along the shore a bit more. We'd had our views though, and thought it was best to leave them be. Meeting up with Alex (son of Martin Keivers of Mull Charters) we found another otter that was bringing his catches out on the shore, and grabbed some more images before the light was lost. We all met up again later in Tobermory for a meal and a catch up. 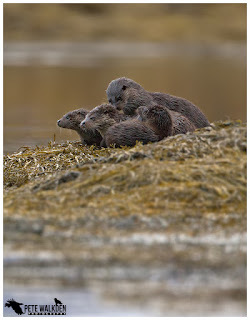 The second tour began where the last left off, with my luck improved, and encounters with groups of otters being the theme for the five days. As well as getting images, I ensured my clients had the best possible view, so at times would keep further back myself, to limit any possible disturbance of the otters. This allowed me to watch the antics, and it was fascinating to observe interaction between otters and other wildlife. 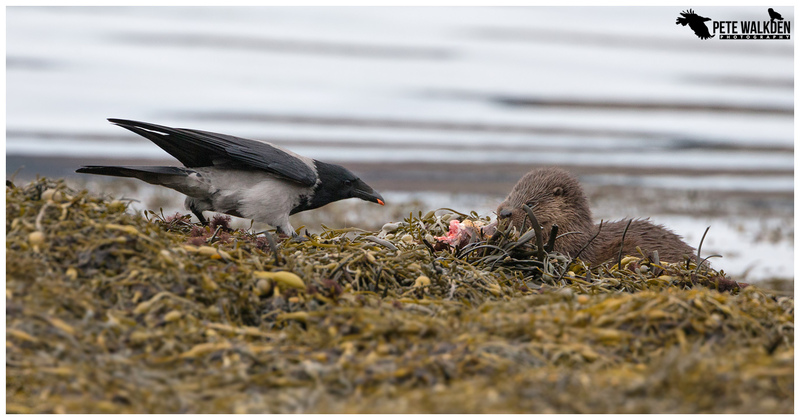 Hooded crows would often crowd the otter cubs when they were trying to feed, hoping to steal the meal. 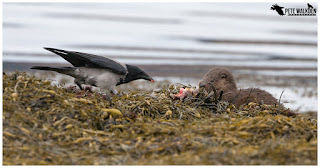 Sometimes they'd get a beakful, and sometimes the otter would leave it all, but other times, the cub would show a bit of aggression, and despite being pecked at by the crows, would retain the meal, and scamper off with it. On another occasion, a cub had been presented with a large fish, while mum went out fishing again. The rubbery skin of the fish made it hard work for the cub to get a meal from it, and mum noticed this. She promptly went out into the loch, and returned with something easier to eat, which was swapped with what the cub had been gnawing on! Didn't stop the cub from trying to steal back the fish again from mum, after it'd finished the smaller meal! After enjoying a marvellous few hours with a mother and cub, we were heading back to base when I spotted another otter off the shore, and as we looked more closely, we realised there were two cubs present as well. Creeping into positions to view from, a fourth individual popped up! The four seemed at ease with one another, so perhaps the other adult was a sibling of the mother, or maybe offspring from a previous litter. The adults were keen to get the youngsters out into the water for fishing, and while one cub duely followed, the other decided it didn't fancy the cold water, and headed back to the safety (and relative warmth) of the small island again, squeaking as it went. The other cub followed suit, and we watched them sitting and playing on the rocks, whilst waiting for food to be delivered. When the adults did return, it was more for fun, and grooming. We watched the mass of fur, paws and tails writhing around from our rapidly shrinking viewpoint. Thankfully the otters posed in a line for a moment, giving us a shot to cherish, before I had to call time on the experience thus ensuring my clients didn't spend a few hours trapped on an island themselves! The following day, we encountered the mother and two cubs once more, and octopus was on the menu. Presumably these creatures are easier for the cubs with their smaller teeth, to manage. Though it was still amusing to watch the pair of cubs squabble over one presented to them whilst they were out in the loch. One finally won the prize, but chose a spot just out of sight of us, to consume it. The final day of the second tour had become a 1-to-1 as one of the clients had had to leave a day early for a family commitment. With the mother and cub pairing on one of the lochs proving to be so productive, we headed over, and found them quickly. Only this time, a third otter joined the group and for the best part of an hour, we watched the cub play with the adults both in the water, and on the seaweed-covered rocks. Leaping, diving, tumbling and squeaking. It was comical at times, and I had to stifle my laughter at their antics. Otter gold, as Andy had put it earlier in the week. The tours were over, and both had been fantastic. Fun, exciting, productive and informative, not only for our clients, but also for us, as we observed new behaviour from the otters. Snow had fallen over the last couple of days, so while Andy was keen to head back up north and home, I chose to hang around on the island for a couple of hours, to enjoy the atmosphere in such wintery conditions. 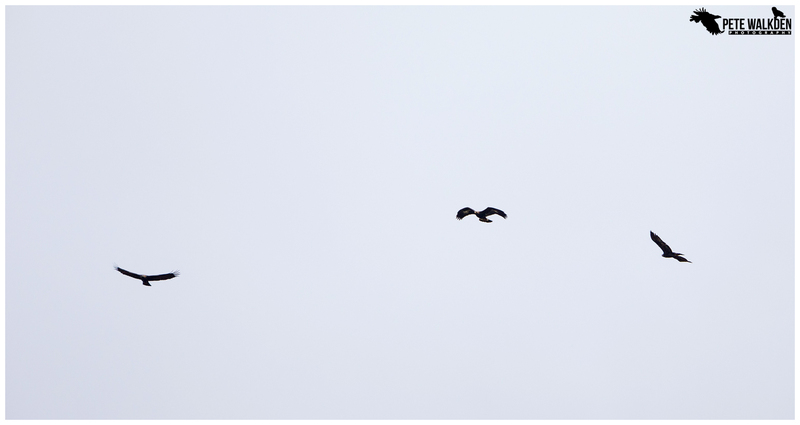 For once, I wasn't chasing otters, and watched both golden and white-tailed eagles soaring over the hills. 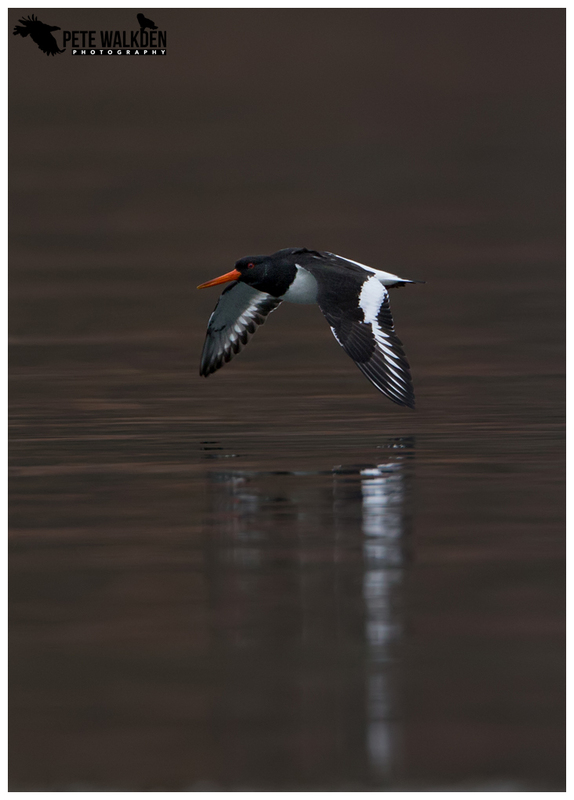 One of the latter was perched on some rocks just off shore - impossible to reach, so I chose to wait further back along the lochside, and hope for a view. 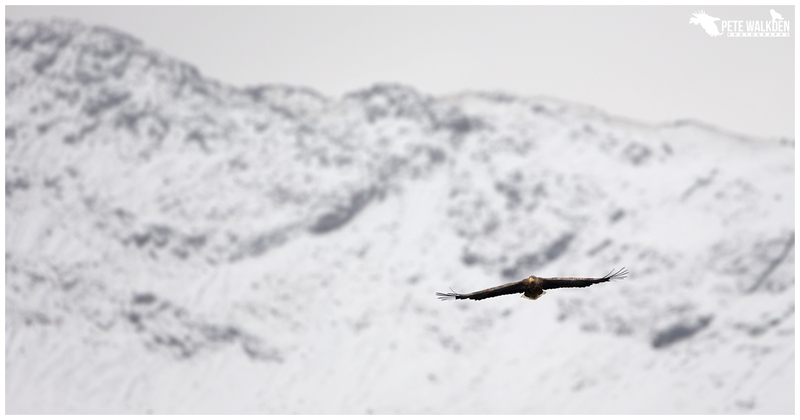 And my fortune continued, when the eagle powered back over the water, giving me some images of it against the snow-covered mountains behind. It was time to say farewell to Mull for 2017 - it has been a wonderful year for visits - and follow Andy north, for a week in the Scottish Highlands.